Hello. I will be leaving for a 2 month Japan Tour shortly! I will play all over Japan from Sapporo to all the way south in Okinawa. This is going to be an epic tour with great musicians supporting me. 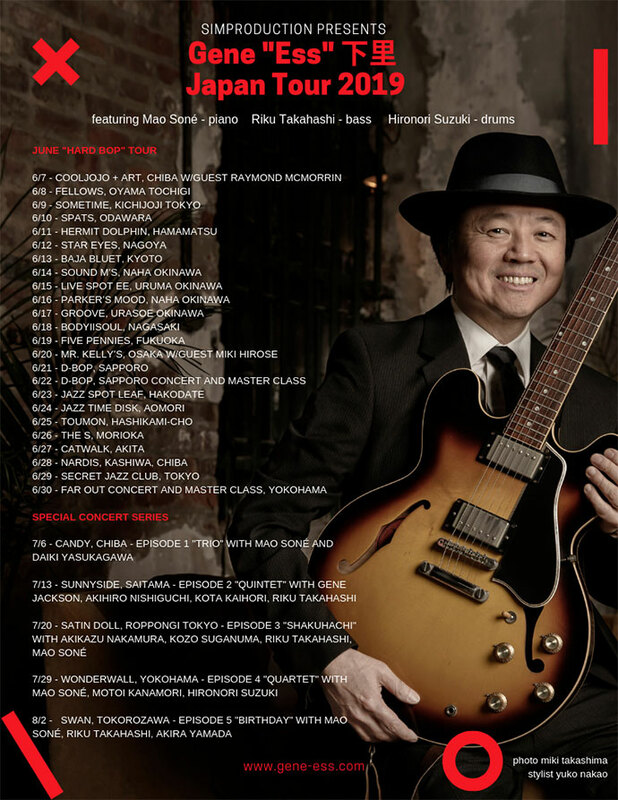 If you are in Japan in June and July, please come say hello at one of the concerts. Sept 1 and back in NYC. Had a great summer in Japan and the tour was really an incredible one having met and made so many new friends and musicians. September always feels like a new beginning for me, probably because of the new school year and the weather turning in to fall. I will be super busy in NYC composing new set of music for my next album which will be recorded in December. I have an incredible team of musicians for this project. Thana Alexa will be on board for the 4th album together on voice, Sebastien Ammann will be on piano, Yasushi Nakamura will be on bass, and Clarence Penn will be on drums. Below is a quote used a lot and almost always mistakenly credited to Aristotle. Funny how in history, the intelligent thoughts of the obscure always travels to the mouths of the prominent. Regardless, it is an inspiring quote which I have lived by all my life. "Excellence is an art won by training and habituation: we do not act rightly because we have virtue or excellence, but rather have these because we have acted rightly; these virtues are formed in man by doing his actions; we are what we repeatedly do. Excellence, then, is not an act but a habit." Gene Ess video lessons coming soon! I will start a video jazz guitar lesson series very soon! The first one will be about the tools (instruments and gear) needed to undertake this huge subject of jazz guitar! As you already know, jazz is vast musical language and certainly very challenging. A lifetime is not enough to master this art/craft and I personally think that is what makes this journey so beautiful! I hope you will enjoy the upcoming series. I will try to do it in both English and Japanese! Keep tuned in and check out my website www.jazzgenemusic.com periodically. Hello and thank you for visiting my new official website. I hope to add interesting and thoughtful content for my listeners. I just returned from Japan and really loved it there. The music scene in Japan is amazing! So much going on with really high level musicians. I will be returning to Japan for all of July and August and will have some really special concerts so please come and say hello if you are in the neighborhood! More details will be provided as the dates get closer! Being back in NYC, I am busy preparing for some upcoming performances. The monthly jazz series at the beautiful Scholes Studio in Williamsburg, Brooklyn will be held on April 29th at 7PM. Also, I will start composing for my next album which I hope to record later this year. For all of you who have listened to my current album "Absurdist Theater", I thank you. I've had great feedback about this album from around the world. Please visit my page periodically and feel free to contact me with your thoughts! Hello and thanks for visiting my site. Hope all of you had a great summer. Fall is upon us and looking forward to a strong finish to 2016. I spent August in Japan and really had a wonderful time checking out the music scene there. Some highlights were when I returned to a famous club in Tokyo named Body and Soul. I played there in 1996 when I toured Japan and Korea with a quartet that included Ravi Coltrane, Lonnie Plaxico, Gene Jackson, and myself. Gene Jackson and I have been working together over the many years since then and he was leading his own trio there when I visited! Also mama-san (the owner) was as young as I remembered her and it was great to see her again. She really is a champion of jazz. She built this club from the ground up way back when. This club is one of the first jazz clubs to have opened in Tokyo! Plus in a man's world that is Japan, she has been able to keep the club open for so many decades. Much respect to her. I can tell she REALLY loves jazz and her club. The other unforgettable event was couple years back, I heard a beautiful song titled Divine composed by a German producer, Albi Albertsson. The lyrics were in Japanese and the song was performed by a world famous k-pop group, Girl's Generation. The song is perfect but what took it over the top was the incredibly beautiful Japanese lyrics. I knew when I first heard this song, that one day, I will meet the lyricist. This song and lyrics gave me much strength, hope, and happiness after all. Well, long story short, I did meet the lyricist and spent many hours enjoying each other's company like old friends. Her name is Kaoru Kami and she is a famous J-pop singer/composer/producer having worked with who's who in Asian pop. I also was treated to her own music as she invited me to her mastering session for her new album. Her songs sound GREAT! In spite of having sold probably 6 million copies of lyrics/songs world wide, she is super humble and a beautiful person. Looking forward to working/hanging with her in the near future as I consider opening an office in Tokyo for my music work. Finally, my new album, Absurdist Theater is going to DROP! Sept 26 global release. Can't wait for all of you to hear the music. This set of music has a very deep personal connection to my inner world. The album was composed in San Jose, Spain during the summer of 2015. We recorded in March of 2016 here in NYC. The album cover photo was taken by myself as I remembered this exact location that was revealed to me in a dream some years back. I know this sounds incredulous but well, it is true. I also want to announce and invite all of you in the NYC area to the album release party that will be held at the Blue Note! September 25 is the date and we will play two sets. First set at 11:30am and second set at 1:30pm. I love these brunch performances at the Blue Note as young people can attend and it is very family friendly. My 13 year old son will attend and hope many kids will come to experience real music that is created with real musicians and step away from the video screen. For more info: www.bluenote.net The group will feature Thana Alexa on voice, Manuel Valera on piano, Thomson Kneeland on bass, Mark Ferber on drums, and myself on guitar. Finally, while in Japan, I got to check out this amazing music project that is BabyMetal. I am convinced Kobametal (producer) is a genius. The music is incredible and so out of the box. He has hired some of the best in choreography, production, audio manipulation, and musicians. Plus the 3 young girls that front this group gives their 120% to the performances. There are two or three songs that would give Stravinsky run for the money in it's complexity. And yet, Kobametal has made the whole presentation super accessible and popular to the pop/metal crowd. They are playing at the freakin' Tokyo Dome as I write this to a sold out crowd of 55,000! And will do it again tomorrow! That's 110,000 packed fans at the Dome. Just amazing. Lastly, I have some news about a new music collective that I will be part of and we will produce our first NYC performance on October 23rd. More info to follow! Well, thanks for visiting and keep supporting live music! Hi there, it has been a long time. As you will notice soon enough, this spring has been a productive one for me, and I am ready to release my new project. I am pretty excited about it, and getting ready to share it with the world at large. As I announced last January, I have been privileged to work with Thana Alexa and Clarence Penn again, as in my prior project, and to have my first collaboration with Manuel Valera and Yasushi Nakamura. Happy New Year! Thanks for visiting my official site. It's been a bit since I last updated but hope to get back to it regularly this year. 2015 was a great year. Good health for myself and family so very grateful. Health is the most important in life as without it, nothing else really matters. The saying "The beggar that is healthy is more fortunate than a king that is sick" is very true. My album Eternal Monomyth that was released in May of 2015 has received a SESAC Jazz Award! Thank you to all of you who have supported this album. A great honor to receive this award as it is based on the support by knowledgeable jazz professionals and the fans in the radio world. This album has received many stellar reviews from around the world and can't be more proud of the wonderful musicians that took part in this music. Thanks to Thana Alexa, John Escreet, Thomson Kneeland, and Clarence Penn for contributing their great musicianship to the project that is Eternal Monomyth. I have been very busy composing for my next album. I finally finished the compositions this past Christmas and am very excited to go in to the studio to record my next album. My group will be in the studio the first week of March and looking for a summer release! The music will feature a very different side to my music. So stay tuned! Thana Alexa will again be featured on voice along with Clarence Penn on drums. Manuel Valera on piano and synths along with bass player, Yasushi Nakamura will join me on this project. The music will showcase my growth as a composer and as a guitarist as it should, right? Thanks again for your support for my music. Without passionate listeners who actually hear the music, a musician wouldn't have much to do about anything. I hope everyone had a healthy and productive summer. With Fall coming up, I wanted to update with some news on my musical activities. My current album "Eternal Monomyth" is doing well and reached #7 on a national jazz radio chart. This album features some really wonderful musicians and people. Thana Alexa on voice, John Escreet on piano, Clarence Penn on drums, and Thomson Kneeland on bass. I'm very honored to have been able to complete this project with them and have it heard by many around the world. I am very busy trying to finish composing for my next album which will be recorded next year in March. I want to bring some new ideas to the table with my music which I haven't before and try to adapt it to a small chamber jazz ensemble. I also decided to really try to upgrade my own guitar playing so basically, I have pretty much moved into my studio. Hopefully, it will lead to new insights and depths to my music. Please look forward to listening to my new music in 2016! And to best understand the musical context and meaning, it should be heard in sequence from Fractal Attraction to Eternal Monomyth to new release! A very exciting thing happened to me in which my story will be part of the new John Coltrane documentary set to be released in 2016. I can't give out details just yet but I am very much honored to have been selected as Coltrane's music is the most significant aspect to my music life. Looking forward to the documentary very much. Having been part of the Rashied Ali Quintet and having worked with musicians such as Matt Garrison, Ravi Coltrane, Reggie Workman, and others from the Coltrane legacy, it is very exciting to share my story with you. Well, that is about it for now off the top of my head. Please keep supporting live music and instead of streaming and downloading, purchase the albums! Without the love and support, music will cease to be. Thanks for visiting my site. Hope the summer is going well for all of you. Earlier this month, I spent some time in San Jose, Spain to compose new music for my next album. It was a great experience and the small village of San Jose is just beautiful. San Jose is about 30km from the city of Almeria and is on the sounthern coast of Spain. I was very inspired by the whole experience and am looking forward to taking the new set of music into the studio to record them! Looking at December or early 2016. The album will be released summer of 2016. Looking back, it feels almost like a dream as the life there is so different from the super urban word of NYC. My current album "Eternal Monomyth" is doing quite well. Especially in Europe and Japan. A big thank you to all of you who have purchased my albums. It reached #7 on a national radio chart and also garnered some great reviews so far. More to come! I have an exciting live performance coming up on July 31. It will be a birthday celebration concert as it is my birthday that day as well. I will have the Song Yi Jeon as guest vocalist. She's really great. I was really taken back at her virtuosic vocal abilities. On piano, Glenn Zaleski. On bass, Yoshi Waki. And on drums, Mark Ferber. The venue is Why Not Jazz Room in the West Village, NYC. 14 Christopher Street. We will play from 8pm to 10pm. Hope you can come down and hang with us. My new album Eternal Monomyth will be available for purchase at a discounted price of $10 as well. That's it for now. Please keep supporting live music! Hope to see you at one of my gigs. Thanks for visiting my official website. We've already reached the halfway point this year and I hope the summer is going well for everyone. The album release has been a success and the new album "Eternal Monomyth" is now available everywhere. Recently, it was #7 on the national jazz radio chart. Very much grateful for the support for my music. My band had some really nice gigs this past month including the gig at Drom in NYC and Falcon in Marlboro, NY. Thanks to all of you that came out to the performances. There is a July 11 and July 31 performance I want to mention here. On July 11, my group Fractal Attraction will play at the Williamsburg Music Center in Brooklyn. The gig starts at 10pm. And on July 31 (my birthday!) I will present my group at Why Not Jazz in the West Village, NYC. That gig starts at 8PM. The July 11 date, I will have Thana Alexa on voice, Yoshi Waki on bass, Clarence Penn on drums, and piano TBA. And on July 31, I will have Glenn Zaleski on piano, Yoshi Waki on bass, Mark Ferber on drums, and a special guest on voice! So come down and say hello and check out some live music. I will be traveling in Spain later in June and early July. Then back to NYC. I will start composing for my next album this summer and hope to be in the studio with my group late 2015 or early 2016! Thanks for visiting and your support for our music is much appreciated! Finally, Spring is here in NYC! I hope all my listeners are doing well and ready for a great year. The big news is my new album "Eternal Monomyth" dropped to radio on April 13. And it is the #1 added jazz album on the national radio chart! Very grateful and humbled by this. I hope you get just as much listening to this album as my band did recording it for your ears. The band features some incredible NYC musicians. Thana Alexa on voice sharing frontline with myself on guitar. Clarence Penn on drums and Thomson Kneeland on bass. And we will feature a great pianist, Dan Tepfer as special guest on this special evening. Looking forward to all of you at my party! Thanks for visiting my site. The new album "Eternal Monomyth" is about a month away from officially being released! I am very excited to announce my album release celebration will take place on April 26, 2015 at Drom in NYC. Drom is a great venue located at 85 Avenue A. The party starts at 8:30PM. Come down and hang with us and enjoy some great live music to nourish your soul and intellect. It's only $15 advance and $20 at door. Hope to see you all at the album release party! April 26th. Thanks for visiting. Hope everyone in the North East is staying warm. The winter has been a bit brutal this year. My backyard is buried in snow and the freezing weather wreaks havoc with my guitars. However, I am looking forward to April 26! 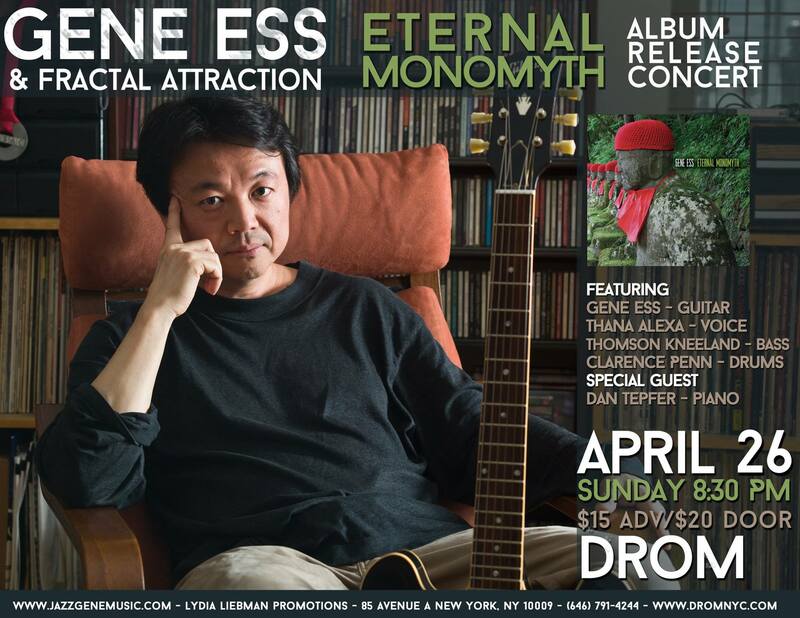 My new album "Eternal Monomyth" is going to be released on April 27 and my group will perform an album release concert on April 26. The venue is Drom in Manhattan. 85 Avenue A, New York, NY 10009. It all starts at 8:30pm. Please come and show your love and support! I am excited to present really great musicians in my group with Thana Alexa on voice, Thomson Kneeland on bass, Clarence Penn on drums, and a very special guest on piano! We will play my original compositions from the new album. An opening band will also be announced very soon. CDs and LPs of my new album will be on sale at the concert as well. In preparation for my new album, I recently spoke with a promoter. She asked me some questions to prepare some promo material and one of the question was which musician would I like to play with and which musicians do I like. This question kind of made me feel awkward because my answer would not really be useful for promo kits. Honestly, I would love to play with all and any person that plays music from their hearts. It would be an honor for me to be able to meet such folks and share real music together. And as far as which musicians I like, well, I like all musicians that play for true reasons from their hearts. Music for music's sake is my mantra and has been for over 30 years now. One of the things I love about NYC is there are many musicians from all around the world that come here because they truly love music and want to contribute to the scene. Very inspiring! More information for the album release will follow very soon. Happy New Year! Welcome to my official site on JazzCorner. A new year, a new start, new energy, forward and upward! Music For Music's Sake. What does this mean in 2015? Being part of the NYC jazz world for over 20 years now, I have seen many talented artists become mere slaves to the thirst of using their talents as a scheme to meaningless pursuits of fame, adulation, and a misguided sense of moneys. In all cases, where I have had personal relationships with these artists, none are even remotely free and happy with themselves. I even know of a world famous musician who confided in me that he wanted to throw himself off of a bridge to end his stay here on earth... It seems the goals they have chosen as they grew up in this world is very toxic and misguided. Their energy where once was innocent and pure have become tainted and diseased by the lure of false gods and diamonds. Some of these artists, I've known since late teens and I remember them back then as truly innocent and pure in their pursuit of music. All of them wanted to contribute beauty to this world in a positive way. And now, as adults, think nothing of stepping on human bonds and friendships to satiate their scheme for false golds. Music being used in such manner never really becomes true and hence, the suffering of the individuals who practice this folly. No matter how much they receive in coins, adulation, awards, and fame will never make up for the betrayal of themselves and their humanity. The anxiety of how easily all of what they've worked so "hard" for can be taken away and given to some other misguided artist must keep them on vigilance 24/7 and so many will end up abusing substances and relationships to appease their narcissisms. The finale in these cases is all very clear. So once again, I go back to what my great teacher Charlie Banacos told me many moons ago. Music for Music's Sake. I am grateful that I have taken his wise words to heart and I will continue practicing my music for music's sake. And that is my mantra again for the new year as it has been for all these years. Let's all cherish our time here and our comrades in arms who fight the good fight. Happy Holidays! Thank you for visiting my official site. Now that 2014 is coming to a close, I hope all of you had a productive and a joyful year. I want to take a moment here and thank all the wonderful musicians and artists I got to work with this year. Truly a honor for me to be able to make music here in NYC with all of these amazing people and musicians. Also, a very big thank you to all of you who support my music and come to the concerts and purchase the albums. I hope you get as much out of the music as I do and it is a blessing for me to be able to share the music with you. Through the music, we shall meet once and once again. My new album is getting closer and closer to release. I am very excited about this new album and looking forward to sharing the music with the world. The new album is titled "Eternal Monomyth" and features 8 original compositions of mine. Monomyth is an universal narrative on the hero's journey told from beginning of humanity and I believe will be told until the end of humanity. In a sense, it is about difficulties of the human condition which has not really improved or changed much over the thousands of years and in this light, there will always be some individuals that will try to go above and beyond the baseline. In other words, we are all in this mess together but some of us are looking up. The band features myself on guitar, Thana Alexa on voice, John Escreet on piano, Thomson Kneeland on bass, and Clarence Penn on drums. The release will include LPs! For the first time, I will get to release my music on vinyl (2LP set) and very excited about this. I have always loved analog audio over digital and looking forward to this. Surprisingly, the sales of vinyl is increasing and that is the only medium of music that is doing so. There were 300,000 units of audiophile turntables sold in 2014 and 700,000 consumer turntables sold as well. A million record players! Amazing. The album will also be released as a CD album and Hi-Rez Download album as well. No SACDs this time around unfortunately. But Hi-Rez downloads are the equivalent (some say superior to SACD) and my album will be available in 24bit 96kHz format. It sounds really great as my team of audio engineers and I paid meticulous attention all the way through from the tracking to the mastering. A new promo video for this new album "Eternal Monomyth" will be online very soon. The album release will be around March 2015 so please be on the lookout! Oh and lastly, the trio I have with Grant Jarrett on drums and Will Slater on bass will be playing at Tolani on December 18 at 9:30pm. Tolani is located at 410 Amsterdam Avenue in NYC. Between 79 and 80th streets. Thanks for visiting. We are now full ahead in Fall and is much colder now in NYC. Can't believe Thanksgiving is just around the corner and how fast time moves. Yet another reason to make sure you live your time here well and with awareness. My new album is moving forward to the final stages. The music is now mixed and will be mastered very soon this month at Turtletone Studios. Michael Fossenkemper is the mastering engineer and he's really good. Looking forward to the final mastered audio! I have already started thinking about my next set of original music and will start composing shortly. I have some ideas but until you start to put pen to paper, you never really know what will happen. I've been very interested in solo guitar music lately along with the sounds of a trio. So I will follow my muse and probably go in this direction. I will be back with some public performances of my group Fractal Attraction soon. I wanted to take a short break from Fractal Attraction gigs to reset and pursue a smaller sound with less density than a quintet. But as soon as my new album is ready to be released, we'll be back playing around! On November 20, I will be back at Tolani with Grant Jarrett on drums and Will Slater on bass. This is a collaborative trio that I have with Grant. Tolani is 410 Amsterdam Avenue, NYC. We start at 9:30pm so come by and say hello. Okay, short but that is it for now. In the meantime, onward and upward! Thanks for visiting my official website. Hope everyone's summer was a good one. Fall is upon us and for me, it feels like a new beginning. In September, I recorded my new album with a great band. Clarence Penn on drums, John Escreet on piano, Thomson Kneeland on bass, Thana Alexa on voice. I composed all the compositions and Thana wrote lyrics to two pieces. I must say, I was a bit spent after the recording as I put in 110% of myself into this project. I am very pleased with the recording and looking forward to getting it ready for a first quarter 2015 release. I feel the set of 8 compositions here represent my best work so far in that my aesthetics were conveyed honestly and quite well. There is a Japanese aesthetic commonly referred to as wabi-sabi. I don't think there are really any English words that can fully explain what wabi-sabi is correctly but here are three definitions which I find useful. "Wabi-sabi is the most conspicuous and characteristic feature of traditional Japanese beauty and it occupies roughly the same position in the Japanese pantheon of aesthetic values as do the Greek ideals of beauty and perfection in the West." "If an object or expression can bring about, within us, a sense of serene melancholy and a spiritual longing, then that object could be said to be wabi-sabi." "Wabi-sabi nurtures all that is authentic by acknowledging three simple realities: nothing lasts, nothing is finished, and nothing is perfect." I personally believe why jazz is so popular amongst the Japanese mind and culture is because by it's own nature, jazz encompasses much of what wabi-sabi is about. And from that aspect, it is very easy for the Japanese to fall in love with jazz. In Japan, there is still a culture of beauty and quality that is still quite prevalent. Although like much of the West, culture of all out consumerism is hovering to crush all the artisans in Japan as well. I will be mixing the recording later in October and mastering the music not much later. The music is recorded in hi resolution and will be released in SACD and vinyl LP format. Not sure about CD quality and mp3s at this moment but I really would like my listeners to enjoy this album's audio quality. The music is recorded with millions of dollars worth of high end audio gear, it just doesn't make sense to listen back to the music with a 50 cent headphone on an iPhone and destroying the high quality audio by compressing it down to a mp3 or even down to the old cd quality. Just my opinion of course. Some of you know that I consider myself belonging to the Charlie Banacos school regarding music and it's philosophy. I feel very lucky to have been able to study with Charlie while he was with us. I find his teachings to be truly great and sort of like jewels that stay with you and your music forever. Each of his lessons are very deep and there is so much to them from a music standpoint. He doesn't teach "magic" as there are none in music training. Only musical facts that you can use for yourselves. He never once told me what to do with the lessons from a creative standpoint. As an analogy to paintings, he taught me the tools and how to use them but never what to paint using the tools. Brilliant man, Charlie is. And now, I have the privilege to continue my work with the Banacos material through his lovely daughter, Barbara. Having a great time studying and continuing in the Banacos music universe! Finally, I want to thank SESAC for awarding my last album "Fractal Attraction" with an outstanding jazz performance award for 2014. Although I don't do music to win awards or such banal things like competitions, I am glad if my music gave some happiness and joy to some listeners. As music from other artists like Coltrane and Keith Jarrett have given so much to me, I hope to be able to give back and have my music move other hearts and minds. Through music, I have learned that what is the most personal to you is also the most universal to humanity. Lastly, on October 16th, I will be at Tolani (410 Amsterdam Ave between 79th and 80th St, NYC) with Grant Jarrett. We start at 9:30pm and will play couple sets. Come down and say hi and listen to some live jazz trio music. Thanks for visiting and listening! Welcome to my website and thanks for visiting. Let's have a productive and fun August as the summer will soon end and become autumn. I am very excited to announce that I have finished composing music for my next album. I am going into the studio in September to record the new music. I am planning on a hi-resolution audio release on a Super Audio CD along with vinyl LP release. Also, downloads will be available as hi-res files from portals such as HDTracks.com and others which will be announced in time. On Sept 5, I will have a quintet at iBeam, Brooklyn. This performance will feature for the first time, Glenn Zaleski on the piano. I've heard a lot of great things about his musicianship and looking forward to this. Thana Alexa on voice, Thomson Kneeland on bass, Clarence Penn on drums, and myself on guitar. We will feature new music to be recorded the following week so it will be a premiere performance of the new music! We start at 9pm and iBeam info is here: The address is 168 7th Street, Brooklyn, 11215. Over the last few months, I've uploaded some videos of my group and music so be sure to check it out. Just go to Youtube and do a search on my name. Okay, that is about it for now. The dog days of summer are here among us and it's quite hot and humid here in NYC. Be careful out there in the music world! It can be a treacherous place. haha. Hello and thanks for visiting my official website. I hope the summer days have been productive for all of you. In July, I have some performances and here are the dates. 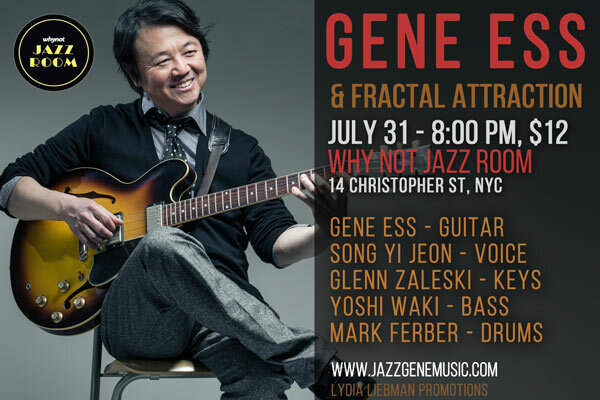 On July 10th, I will be at iBeam, Brooklyn with my group Fractal Attraction. The venue is located at 168 7th Street in Brooklyn. More info at ibeambrooklyn.com. This concert is part of the Kettle Music Collective monthly music series. This is a triple bill and it all starts at 8PM. My group will go on at 9PM. The group will feature Thana Alexa on voice, Gabriel Guerrero on piano, Thomson Kneeland on bass, Satoshi Takeishi on drums, and myself on guitar. Hope you can make it out. I just returned from a very wonderful and productive time at Woods Hole, MA. I take my family there once a year and compose music for my band and also to get away from the concrete jungle of NYC. I finished composing music for my new record to be recorded in September so I am quite excited about it all. I also take some time to take a flight lesson or two as getting my private pilot certificate is on my bucket list! This new set of music will be very different from Fractal Attraction and I think is full of challenges in the interpretations and the performance aspect of it. I have a stellar cast to help me realize my musical vision and am very grateful. Thana Alexa is on board to bring her beautiful voice. We've worked a bunch over the last few years together and I think this will really help as she is the frontline along with my guitar for the music. I hope we understand each other better musically by now. Thomson Kneeland will be the bass player and this is the third consecutive record he's on with me. So that goes to show how much I like his playing. On piano, John Escreet. This is our first time working together but from what I have heard, he's the perfect pianist for this music. And finally, Clarence Penn will be on drums. Clarence and I did a gig earlier this year at ShapeShifter Lab and he is the perfect drummer for this new set of music. So be on the lookout! We will be in the studio early September. That's about it for now. Please keep supporting real music and musicians. The current state of the world needs them. Thank you. I have been working on some music projects with Grant Jarrett and that has been a lot of fun. He comes from a really talented family and is getting stronger on the drums daily. We will be at Somethin' Jazz Club on June 26th at 9PM. This will be a quintet with Grant on drums, myself on guitar, Thana Alexa on voice, Dave Ambrosio on bass, and Sebastien Ammann on piano. Grant and I are planning to record our first album together in December so that is coming up as well. My group will be in the studio in early September. I have been composing new music for this project and very excited by the direction the music is taking me. This will be a follow up to my Fractal Attraction album and will once again feature Thana Alexa and myself on the frontline with a stellar rhythm section. I have uploaded a handful of live performance videos to youtube. If you are interested, just do a search on my name and you will have access to them. On July 10, my group Fractal Attraction will be at iBeam, Brooklyn. 9PM set. This performance is a Kettle Music Collective presentation and will also have Andrea Wolper's group and Connie Crothers' group for a triple bill. It all starts at 8PM. Okay, that is about it for now off the top of my head. Happy Summer! Greetings! It is May already. As promised, the video of Fractal Attraction is now published on Youtube. Two songs are now up and more will follow. Check out my Divertimento page here to click on the URL. Or you can just go to Youtube and search my name. The performances in April was a lot of fun and thanks to all of you that came and supported live music. I want to invite all of you to a performance I am looking forward to. On May 19, I will be at ShapeShifter Lab in Brooklyn. This is a very exciting event for me as a great young pianist Sebastien Ammann and his quartet will double bill with my group. My group will feature Thana Alexa on voice. She is so much more than just a singer and scats solos that are truly organic and musical. The rest of my group aren't shabby either. Will have David Berkman on piano, Thomson Kneeland on bass, and as guest Clarence Penn on drums. Clarence is just a great drummer that knows what to play and not to play and serves the music. And he always swings hard. Looking forward to it. It all starts at 8:15PM. My group will go on at 9:30PM but come for both bands. The cover is truly affordable at only $10! For more info: www.shapeshifterlab.com. I am in the studio this month composing around the clock. And my recording session is now set for September. I am hoping for a late fall/early winter release of my next album! Just this past month, I teamed up with drummer Grant Jarrett and formed a collective trio. We are calling ourselves NY Triptych. Now that the cat is out of the bag, and the fact that everyone is asking me about Grant, with his permission, yes, Grant is Herbie Hancock's younger sister. A very talented writer and musician in his own right. Please come to our future gigs to hear him yourself. Hopefully, we'll go into the studio before long to record our first album. We just did our first trio gig at this venue called Tolani. And we will be at Somethin' Jazz Club on June 26. This performance will feature Thana Alexa on voice! Very excited for this new project. Okay, that is it for now. Thanks for listening! Hello. Spring is upon us and I am welcoming the above freezing temperature here in NYC finally! Hope all of you are having a great start to 2014. My band, Fractal Attraction completed it's first video performance and I am now in the post production stage. I will be mixing the music shortly and get the video all set up so be on the look out! I think there are some very nice moments in the music. Fractal Attraction will be performing at iBeam, Brooklyn on April 10th. This is a Kettle Music Collective event and will feature three groups. Chris Forbes will present his trio at 8PM. My group will be on at 9PM and Connie Crothers will perform at 10PM. Please come support live music. We put a whole lot of work into these events and would love share our music with you. Come nourish your soul and intellect. More info at www.ibeambrooklyn.com My group will feature David Berkman on piano, Thana Alexa on voice, Thomson Kneeland on bass, Cory Cox on drums, and myself on guitar. On April 25, I will bring a trio + guest to Why Not Jazz Room in the West Village. This is the first time I play at this new venue. A very cozy place with a full menu of drinks and food. We start at 8PM. Come down and hang! My trio will be myself on guitar, Thomson Kneeland on bass, and Gene Jackson on bass. Looking forward to playing in a more open musical space. Guest is a surprise! On May 19th, I will be at ShapeShifter Lab. Double bill with Sebastien Ammann Quartet. My band will feature Clarence Penn on drums. Looking forward to his take on my Fractal Attraction music! Hope to see you here. The event starts at 8:15PM. Currently, I am also composing for my next recording. A long and arduous process as I am a bit of a perfectionist and need the music to be just right before I accept the work. But when the music is composed, I will be back in the studio to record them. Well, thanks for visiting and keep coming back to my site for updates and news. Hello and welcome to my website. Winter is being stubborn this time around and won't go quietly. Experiencing a polar vortex of sorts although it is already March. Having grown up in a tropical island, this deep freeze is getting to me! I am very excited about going into the studio later this month to record and video tape a performance with my group Fractal Attraction. And I am also very fortunate to have all the regular members around to do this! The group is myself on guitar, Thana Alexa - voice, David Berkman - piano, Thomson Kneeland - bass, and Gene Jackson on drums. Hopefully, I will be able to share the video performances with you in April. I've been getting great feedback from interested students around the world about my video lesson on Truefire.com. This is part of Bruce Arnold's NYC Jazz Guitar Summit project. I am very honored to be part of this DVD release of amazing collection of musical knowledge. Check it out at truefire.com. It is true that not everyone is born with the talent to become a great jazz guitarist but everyone can improve upon their own current level of musicianship. And that is far more interesting to me. On May 19, I have a performance at ShapeShifter Lab in Brooklyn. I am very excited about this gig. It is a double bill with a very talented young pianist, Sebastien Ammann's quartet and my group Fractal Attraction. On this night, one of my favorite drummers here in NYC, Clarence Penn will be part of my group as Gene Jackson will be in Japan. Clarence Penn and I have been trying to connect musically over some time but our schedules have always gotten in the way. Well, on May 19, we will finally do it! So come down and check us out. We hit at 9:30PM. Seb's group will go on at 8:15pm. That is on May 19. Mark the date. ShapeShifter Lab for more info. Okay, that is about it for now. Let's hope Spring is just around the corner! A belated Happy New Year! Hope this year will be productive and healthy for all of you. And thanks for visiting my site. A big thank you to all that came to my group's performance at Somethin' Jazz Club on Feb 1. It was a very fun gig and your presence added to the great vibe of the performance. Some upcoming events for my group Fractal Attraction. The album of the same name has been doing very well and peaked at #3 on the National Radio Chart in 2013. I will be going back into the studio to record my next album this year. More specific details will be announced soon. In March, my group will taping a video for the Fractal Attraction album. But in the mean time, you can hear one of the cuts from the record titled "Silver's Fate" here. This will be my first attempt at doing a performance specifically for video release. More performances are coming up for my group and I will post dates as they come. On June 15, I will be at the Red Hook Jazz Festival in Brooklyn. It is an annual outdoor jazz festival and should be a lot of fun. Finally, on Jan 20, 2014, the world lost a great musician in Claudio Abbado. He is one of the great Italian conductors and his music has been a part of my life since I can remember. One of his quotes I read when I was studying classical piano at age 8 was "I have to make a choice. I have to leave this world. Or I have to leave music. Now I know what to do." That made a profound impression on me as a child and after many years, it still speaks to me and resonates. Thank you for your music, Maestro. RIP. Alright, so that is about it for now. I will try to be more timely in my updates of my website. I have some recent photos of gigs I'll upload soon. Thanks for listening! Thanks for visiting my official website. I hope everyone had a productive summer. Autumn is quickly upon us and in my little world, bustling with new music and energy. First off, thanks for the great support of my new album Fractal Attraction released this past May. The album hit #3 on the National Jazz Radio Chart and was in the top 10 for many weeks. I've received very encouraging feedback and reviews from around the world! The album release concert at ShapeShifter Lab here in NYC was very notable as well and thanks to all that attended the performance. The iBeam residency with the Kettle Music Collective has been ongoing and we just finished our last performance there for 2013 this past week. The next performance of Fractal Attraction that is scheduled currently will be in the LES of NYC. The venue is called Spectrum and is our first appearance there. Heard some great things about Spectrum. They have a well kept Steinway D to say the least. Looking forward to the date. It will be Saturday, Nov 30 at 8:30PM. Young cellist, Lester St. Louis will be sharing the bill with my group. Mark the date down and come hang and listen to some great music. More info here. I have a whole bunch of video footage from the past Fractal Attraction concerts that I need to sort through. I'll try to upload some of them soon. Again, please support the music if you like what you experience as it is the independent artist's means of survival and lifeblood. It is getting much more difficult to bring high quality music to the listener as things like Pandora and Spotify have pretty much killed any deserved revenues for the artists. Go out and check out a live show, buy an album, keep true music alive! You can browse my works on the recordings page here or check out www.cdbaby.com/artist/geneess. Recently, I was featured in a new book by photographer Salvatore Corso. The book is titled "13 Questions Around Jazz". It is a photo documentary of artists in the NYC jazz scene. Very honored to have been included in this beautiful book. Check it out here. This autumn, I will be composing quite a bit in anticipation of my next album. I hope to be in the studio with my group to record the new work early 2014. I'll keep you posted! Thanks for the interest in my music and best to all of you. Thanks for visiting my site. I have some very exciting news for the month of May. First off, my new album Fractal Attraction is going to be released on May 8th. We are going to celebrate it by throwing a CD release party at ShapeShifter Lab on May 8th. It all starts at 8:30PM with the rising-star vocalist Bogna Kicinska and her Quartet opening the evening's festivities. She has a stellar group and also Scott Tixier (violin with Herbie Hancock) on board as special guest. Really looking forward to her performance. I've had the chance to do some concerts with her and she's really fantastic. At 9:30PM, my group will play music from our new album. My group features Thana Alexa on voice, David Berkman on piano, Thomson Kneeland on bass, and special guest Ari Hoenig on drums. I will be on guitar. The music features compositions by myself and a piece from Thana. There will be hardcopy CD albums available for purchase at a special discounted price of $10 during the evening. The group is sounding really great as the music developed over the last four months of playing together. Ari Hoenig is a very renowned drummer here in NYC for a reason and really looking forward to hearing how he will interpret this set of original music. I am honored to be surrounded by such great musicians for this performance! The frontline color of my guitar and Thana's voice really blends well and is very unique and compelling, I think. Hope you can come to the performance and hear for yourself. The concert will be available as an internet stream for folks that are not in the NYC area. Visit ShapeShifter Lab for more information. This allows you to watch the concert in real time as it happens on your computer. You'll need a decent speed connection to the web, however. I want to give thanks to all of you that have supported and attended my past concerts. The monthly residency at I-beam, Brooklyn has been a lot of fun. We will continue on May 31st at 8:30PM. Andrea Wolper's group will share the bill with us on that night. The music can't happen without your generous support and we thank you. I sincerely hope that the music gives to you as much as it gives us performing for you. On May 24th, my group will perform for the first time at a new venue, Caverock Room in Bushwick, Brooklyn. The venue is owned by Logan Thomas, a fine pianist. I first heard him with the group Manner Effect which features Sarah Charles on vocals. He was kind enough to invite my group for a concert on the 24th. It starts at 9PM. I believe after our performance, Logan will lead a jam session so for you musicians, bring your horn and chops! This concert will feature some new musicians. We will have Gabriel Guerrero on piano and Satoshi Takeishi on drums. Regular members of my group Fractal Attraction: Thana Alexa, Thomson Kneeland and myself rounds out the quintet. Well, Spring seems to finally have arrived here in NYC. It was long overdue. I sincerely hope to see you at one of the concerts. We work very hard to bring it to you, the listener. And in this world, where one commits to bringing beauty in spite of the conditions presented by modern humanity is certainly something to be cherished. Hope our politicians shared some of the courage and wisdom musicians show here in NYC. Hello, readers. And thanks for visiting my site. Very excited to announce my new album "Fractal Attraction" is now recorded and will shortly go into replication. Slated for an April release so keep tuned in here. This album is a work of 8 original compositions and performed by a quintet. Thana Alexa on voice, David Berkman on piano, Thomson Kneeland on bass, Gene Jackson on drums, and myself on guitar. I believe this album is my best work so far and very proud of how it all came together. The music uses voice in an unconventional format, I think, for a jazz quintet. Thana really did an incredible job on this record. Really looking forward to having you listen and hopefully hearing the music as well. The Kettle Music Collective residency at Ibeam, Brooklyn continues. My group will perform on February 22nd at 8:30pm. Please come support live music. And thanks to all of you that has made the previous performances. More dates will be announced soon including "Fractal Attraction" CD release concert! Happy Holidays! Wishing all my listeners a great Holiday Season. I can't believe it is the end of 2012 already. But looking forward to a great 2013 filled with music. This week, my group Fractal Attraction will be going into a recording studio to record my new upcoming album. I am looking forward to this very much. The music is all original and is a follow up to my "Thousand Summers" album which was released in early 2012. I have the perfect cast of musicians supporting me on this project. The music will feature Thana Alexa on voice, David Berkman on piano, Thomson Kneeland on bass, Gene Jackson on drums, and myself on guitar. Projected for a March 2013 release. Stay tuned and check back. My previous albums are on sale at CDBaby.com for a discounted price of $9.99 during December. They make great holiday gifts. Thank you as always for all your support. My music can't happen without your listening and support. I am very grateful. Just a heads up on some upcoming performances. My group will be performing at Ibeam, Brooklyn www.ibeambrooklyn.com on Jan 27, 2013 at 8:30PM. It is a double bill with Andrea Wolper's group and is part of the Kettle Music Collective Winter mini-Fest. My group on this performance will feature Sara Serpa on voice, David Berkman on piano, Aidan O'Donnell on bass, Rudy Royston on drums, and yours truly on guitar. We will be performing at Ibeam on a regular monthly basis so stay tuned. Had a handful of great gigs this past month in spite of Hurricane Sandy. Thanks to all that came out and supported live music. Hope you were inspired by the music just as much as I was playing it for you. First, want to mention that my thoughts go out to all that took on damage and lost loved ones from hurricane Sandy. NYC where I reside took on some serious damage but will recover quickly, I'm sure. We NYCers are a resilient bunch. Nov 2, Friday. It all starts at 8PM. My group "Fractal Attraction" will play at 8:30PM followed by Maryanne DeProphetis Group at 9:30PM. Hope you can make it and support live music. And on the 9th of Nov, we will be back at Ibeam with my group and Andrea Wolper's group. I am very excited about my new project. The band members are David Berkman on piano, Gene Jackson on drums, Thomson Kneeland on bass, Thana Alexa on voice, and myself on guitar and compositions. We will start doing a residency at the Ibeam starting January of 2013 as well so keep tuned. The band will go into the studios in December to record a new album which will be released in Spring of 2013. Looking forward to all this. You can see many of my work at http://www.cdbaby.com/Artist/GeneEss. Thank for your support and listening. Thanks for visiting my official site. Hope everyone is having a great summer. Fall will be upon us soon. A big thank you to all that came to the debut of my new band/project "Fractal Attraction" on Aug 2. The performance was a lot of fun and we are very grateful. I am excited to announce Fractal Attraction will be back at ShapeShifter Lab on August 30, 2012 at 8pm. This time, I will have Gadi Stern on piano as guest along with Thana Alexa on vocals, Thomson Kneeland on bass, and Mark Ferber on drums. Hilary Gardner and "Shotgun Wedding" will be part of this double bill concert. It is going to be a real fun evening. Please come and support live music. ShapeShifter Lab is in Brooklyn. On September 8, we will be in Harlem, NYC at a venue called Shrine. One set @ 8PM. Looking forward to seeing you. And in December, we will go into the studio to record a new album slated for release early 2013. So a whole bunch of music is going on and loving every minute of it. It is a blessing to do what you truly love 24/7! I am adding some new promo shots and pictures from gigs to the gallery so check them out as well. Enjoy the rest of summer and don't let the "Dog days of August" bite! Jam session continues at the ShapeShifter Lab thru July. Sundays at 3PM. Come down and play. And I will be busy writing new music for my August music series at ShapeShifter Lab. More info to follow! My weekly jam sessions have started and will continue every Sunday at 3PM at the great venue ShapeShifter Lab. Please come and support this great jam and share your talents. For more info, visit www.shapeshifterlab.com. Thanks to all that attended my first performance at ShapeShifter Lab on May 28th with Dave Liebman. The gig was great and we had a great time playing music for you. I'll be back at ShapeShifter with more music soon. In August, I'll have a mini-series there starting on Aug 2 and every other Thursdays (3 concerts). I am also composing for my next album projected to be recorded in October with Thomson Kneeland on bass and Gene Jackson on drums. Looking forward to it all. Thanks for visiting and have a great summer. A whole lot has been going on which I am very excited about. So let's get right to it. One of my favorite singers is coming to town and we will be doing a mini-tour of NYC with her. I had the pleasure to meet and play with her at the Blue Note last year. Actually, having worked with her, it got me in a whole new musical direction which culminated in the release of my "A Thousand Summers" album this past February. The album is doing great and broke the top 10 of a National Radio Chart. Thanks for your support. The singer I am talking about is Niki King. She's from Edinburgh, Scotland. She's quite well known in U.K. and is a former recipient of the prestigious "Jazz Vocalist of the Year, U.K." award. Love playing with her. May 21, 2012 @ the Bar Next Door, 8:30pm and 10:30pm sets. www.lalanternacaffe.com with Niki King- vocals, Gene Ess-gtr, Thomson Kneeland-bass. May 23, 2012 @ Flute Gramercy, 8PM to 11PM www.flutebar.com with Niki King-vocals, Gene Ess-gtr, Thomson Kneeland-bass. May 26, 2012 @ Somethin' Jazz Club, 9PM www.somethinjazz.com/ny with Niki King-vocals, Gene Ess-gtr, Harvie S-bass, Bruce Cox-drums. And on May 28th, Niki will be a guest with my group which will include the great Dave Liebman! 9PM Set. @ ShapeShifter Lab, Brooklyn. www.shapeshifterlab.com with Gene Ess-gtr/compositions, Dave Liebman-saxophone, Adam Birnbaum-piano, Thomson Kneeland-bass, and Rodney Green-drums. Niki will also be singing on a couple of tunes! On June 10th, I will be back at the famed 55 Bar in NYC. www.55bar.com the Set starts at 9:30PM. Gene Ess- gtr, Adam Birnbaum-keys, Thomson Kneeland-bass, and Mark Ferber-drums. Starting the 1st Sunday of June, I will host the jam session at the great new venue ShapeShifter Lab in Brooklyn! 3-6pm. I will run an open and constructive jam session which welcomes ALL musicians and creative minds. Looking forward to this. Come support this new venue and the musicians that make it special. I also have a really nice concert on July 14th at the Falcon. www.liveatthefalcon.com/#Ess This concert will feature the wonderful musician/singer Nicki Parrott. She sang on my last album and I am very excited to have her on this gig. 7PM start! I will be back at ShapeShifter Lab every other Thursdays with my group in August (3 concerts) starting on Aug 2. Aug 2 is my son's birthday and mine being July 31, we will also celebrate it with a birthday bash! Hope to see you at my performances. Please join me at www.facebook.com/gene.ess where you can see a lot of updates in real time. Hello and a belated Happy New Year. I hope 2012 brings a joyful and healthy year to all of you. And especially to the world as a whole. We have so much angst in this world. Music really is a universal language and heals a lot of souls. I know music did that for me and gave me so much. I am very excited to let you know my new album "A Thousand Summers" is just about to be released. It will be released on Feb 1 so buy a couple or a bunch. The album is my first using a singer and features Nicki Parrott. There are some advance copies available only here on my website through Jazzcares.com, however, right now. You can go to my recordings page and check it out. A percentage of the sales will go to the Jazz Foundation of America and will go to helping jazz musicians in need of assistance. A very worthy cause, I think. So not only will you be enriching your soul with quality music but helping an artist who've worked hard bringing music to the world in his/her time of need. The album will be autographed by yours truly as well. So go to my recordings page and get a copy for yourself. Thanks for listening. I hope to see you at the Blue Note concert! Greetings. I am very excited to let you know my new album is now recorded and is slated for a February 2012 release! The album is titled "A Thousand Summers" and features the lovely Nicki Parrott on vocals. I chose ten beautiful songs from the jazz canon and arranged them in such a way that will allow us to keep our musical integrity and really play. I think the music is a success and have received nice feedback from my musician peers. The songs were arranged by me and Thomson Kneeland. We will be performing a Thanksgiving concert on Nov. 22, 2011 at 7pm. The venue is a really nice club, Somethin' Jazz Club @ 212 E 52nd St, 3rd floor, NYC 10022. 2 sets - 7pm and 8:30pm. $15 cover. Gene Ess - gtr, James Weidman - piano, Thomson Kneeland - bass, Gene Jackson - drums, and featuring Nicki Parrott on vocals. I hope you can be there to be part of the music. This will be our last gig together for the year until our CD release performance in early 2012. I am also updating the photo gallery with some new pictures. I will be recording my next album this month. The album will feature some beautiful songs that I've wanted to record for some time. I am going back to my roots a bit as I came up playing the jazz standards repertoire. The group is a quintet with Gene Jackson on drums, Thomson Kneeland on bass, James Weidman on piano, myself on guitar, and will feature Nicki Parrott on vocals. I arranged half of the repertoire and Thomson did the other half. I wanted to have another musical perspective along with mine in the album. Having the results in hand, I think this worked out well. My previous albums were always my own compositions and instrumental music so I am looking forward to this new experience. Having recently performed at Blue Note with a singer made me realize I've always wanted to explore this area of music. The album should be released around the holiday season. We already have a performance scheduled in NYC for Nov 22nd at 7PM. A pre-Thanksgiving Holiday performance and will give a preview of the album. Hope you can come and support the music. E/V train to 53rd St./ Lexington,Â 6 train to 51st St. The group will be the recording band from above. Looking forward to the performance. I will keep all of you posted with the soon to be released album and more upcoming dates as they are announced. Hope your summer was a productive and happy one. My group will perform at the Miles Café here in NYC on Oct 30th, 2010. We will do two sets starting at 7:30pm and finishing at 9:30pm. With me will be Harvie S on bass, James Weidman on piano, and Gene Jackson on drums. We will be playing music from my "Modes of Limited Transcendence" album. As an added bonus for you, if you RSVP and send me an email with your name and attend the gig, you will receive a free copy of the "Modes of Limited Transcendence" CD at the performance. This album features Tigran Hamasyan on piano, Harvie S on bass, Tyshawn Sorey on drums, and myself on composition and guitar. It received a SESAC Outstanding Jazz Performance Award earlier this year. Well, that is about it for now. Hope to see you at one of my gigs soon. A quick update to let you know I will be taking my trio to perform at La Lanterna/Bar Next Door on Nov. 21, 2009. This club is a great place to listen to live jazz music. It is very intimate and comfortable. The music sounds as it should and the vibe is great for musicians as well as the audience. It is in the heart of Greenwich Village right around the corner from Blue Note. The price is very reasonable as well. I will be presenting music in a trio format. The rhythm section will be Harvie S on bass and Gene Jackson on drums. We will be performing my originals and interpretations of some jazz standards. My next album will be coming up in 2010. I am getting busy composing the new music. Look out for it! And lastly, have a very happy holiday season. It is upon us again so quickly. Thanks for visiting. I just wanted to let you all know that I will be back at the Blue Note on Sept 13, 2009. I will be presenting music in a double guitar quartet format with Rodney Jones. The rhythm section will be Harvie S on bass and Joey Saylor on drums. We will be doing originals by members and interpretations of some jazz standards as well. Hope everyone had a productive and healthy summer. It flew by for me and looking forward to the fall! Hello and thanks for reading. Some updates to what is going on here in NYC with my music. I’ve finally finished composing for the new album. Took a heck of a lot of work and effort but I am finished and that’s that. No more revisions, etc. I think it reflects where I am at honestly and I will be recording the music in June. I think the music has grown a bit since my last work "Sandbox and Sanctum." Joining me for this experience is Harvie S on bass, Tyshawn Sorey on drums, and Tigran Hamasyan on piano. I am very blessed to have such a wonderful group of musicians to work with and to document my music. Especially, considering there is not much of a commercial upside to my music. Perhaps that is why these men are at my side. I have absolutely no use for music made for some commercial product/entertainment. As I have grown older, my long lingering doubts of living one’s life to satisfy some imagined commercial need is even stronger. In my opinion, the customer is not always right. I create what I must create. I do what I can to get the music "out there" but other than that, I think the music takes a life of its own once it is released. The music will do what it was meant to do. I think, although it is a difficult time in this world now, a time of great opportunity exists for philosophers, artists, and all creative spirits. The world is in a dire need for us now. And because of the technological time that we live in, it has become much easier for us to share our works. To have contributed what you were meant to contribute to this world is something only the happiest man can say at the end of life. Harvie S and I go back a bunch of years now. HeÃ­s sort of a "brother in spirit" to me. Notice our last names are the same phonetically. Harvie, to me, is the perfect bass player. He makes the music sound better and has a tremendous amount of character in his playing. Great feel and musicality as well. Glad he’s on board. Tyshawn Sorey started playing with my group in 2007. He’s a young player but a wonderful artist. His musicianship far exceeds his age. He’s getting real busy now with the likes of Steve Coleman. His schedule worked out so it’ll be great to hear how he brings his musical vision to the music at hand. Tyshawn has the ability to play what the music needs at any given moment. To play for the music instead of the ego. A rare character in most virtuoso musicians. And last but not least, Tigran Hamasyan will join us on the recording. I have never worked with Tigran. But when I heard his music, I knew right away that he would be perfect for this music. I was quite surprised when I found out he’s only in his very early twenties! He’s based in Paris and LA, I think. Certainly, I would have killed to be able to play as well as he does at 21 years of age. I believe he’s also the winner of the Monk Piano Competition couple of years ago. Although I find Competition and Art to be 180 degrees apart, alas, it is still a great achievement for such a young man. Reminds me of something a very wise man told me once: "I find the notion of having Miss Universe competitions to be insulting and demeaning. But the women are beautiful." I have some performance dates in June in conjunction with the Recording Dates. June 12 at Cachaca, June 17 at Drom, June 21 at Open Road Park, and June 9 at Spike Hill. Please check the Jazzcorner Gig page to see the details. I’ll post the info there. Ciao for now. See you at one of my gigs! Thanks for visiting my site. It's been a year since I updated the Projects page. Time just flew by and doesn't seem that long at all. Note to self: need to do a better job updating website. A lot has happened since the last update and after many gigs and composing and tweaking my new compositions, I'll be recording my next album in the next few months. The scheduling is tough as everyone is busy and I have to try to find a time when everyone is in town for the sessions. I hope the music will reflect the growth in my musical expression since my last album. For me, it doesn't make too much sense to put out a bunch of the same stuff over and over again. I agree with Bill Evans that you should let the music dictate when to put out another album. Bill Evans the pianist, that is. My group will be performing at the Blue Note for the 7th time on February 17th, 2008. It's a Sunday and the performance starts at 12:30PM. The second set is at 2:30PM. My group is still a quartet but I am now using a piano instead of a saxophone. A whole new color and density to my music comes out by having a good pianist in the band. The group will be Harvie S on bass, Gene Jackson on drums, Toru Dodo on piano, and myself on guitar. The brunch is very family friendly and a lot of fun. My son who is now 4 years old will be attending so I will have to play my best! I hope you can come and enjoy the music and be part of the creative experience. The music can be so much better with a great audience to inspire the process. I've been doing quite a bit of sideman gigs lately. It is kind of fun to just show up and play without worrying about all the things the leader has to deal with in the course of any gig. Check out my www.myspace.com/jazzgenemusic site to see my schedule of performances. I also list my own gigs here at the Jazzcorner gig calendar so keep an eye on that. There might be some videos coming from upcoming gigs so if they are presentable, I will upload some clips to checkout. Keep checking my site for updates. Well, let's see. That is about it off the top of my head. I am going to upload some more current pictures for the gallery and some updates to Divertimento so come back soon! Hello and thanks for visiting. It has been a while since I updated but a lot has happened since then. I have a new collective trio project with Tomas Fujiwara on drums and Chris Higgins on bass. We will be doing our first public performance at ABC no Rio on February 18th. The 1 set performance starts at 8PM. ABC no Rio is one of the only art/community centers left in New York City. It is located at 156 Rivington Street in the Lower East Side of Manhattan. I am excited about the musical possibilities of this trio. Please come and support the music as well as the art center. On March 11th, I will bring my group to the Blue Note for the sixth time. The performance starts in the afternoon at 12:30PM. Being a brunch performance, it is family friendly. My 3 year old son will be attending as he seems to really like music. The quartet will be Harvie S on bass, Eric Person on sax, Pete Zimmer on drums, and myself on guitar. We will be performing some of the new material to be recorded later this year for my follow up album to Sandbox and Sanctum. I have few more pieces to finish composing and I will be off to the studio to record the next album. I plan for a release later this fall. It will have a different theme than my last album but carry over the spiritual nature of the music. I want to mention that I have begun endorsing couple of musical instruments. I now play a CP Thornton guitar and Leonardo Speaker cabinets. I am in the process of adding a gear page to my site but wanted to mention these 2 great tools now. Luthier CP Thornton built a guitar for me that is seamless for me to express my music. The Leonardo speaker cabinets are focused and emits great tone. It works great in a jazz context. Check them out on the web if you have interest in guitar gear. I'll give the details along with pictures as my gear page develops. During the last fall, my family moved to a new home here in New York. We are very happy as the place is more than double the space of my previous digs. My studio is now in business and can take on most post recording session projects. Mixing and mastering for CD release is its strength. Contact me for more info at gene@jazzgenemusic.com if you have a project in mind. Also, I have a few slots open for serious advanced students. Well, that seems like all for now. See you at one of my gigs. Thanks for visiting my site. Now that winter is about gone, I am ready to get going with more musical projects. It has become a sort of a "habit" of mine to enter a reclusive space during the 3 months in winter to write new material and work on my music. I try to match my musical output to what I am hearing internally during this time. Plus, it is great for the spiritual side of my life to step away from the noise once in a while that exists in the music industry. First, I'd like to mention my concert at the John Birks Gillespie Auditorium on March 28th, 2006. The quartet will feature Dave Liebman, Harvie S, Take Toriyama, and myself. Dave played with my group at the Blue Note last November and he sounded wonderful on the music. The concert is at 8PM and 9:30PM. 53 E11th St, NY, NY 10003. In order to make this concert a success, I need you to please attend and show your support for the music. Thanks. Thanks to all of you who have emailed me about my latest cd. I appreciate all your feedback. The album has received great reviews (you can see some of them on the divertimento page) and is now playing on a lot of jazz radio stations. If you can call your radio station to request my CD, that would be very helpful. As an independent artist, I have to rely on grassroots promotion to survive. And I mean that literally. A friend of mine who is a well known musician recommended signing up at myspace.com. I thought he was joking because I had heard some negative things about that site. However, upon further investigation, I realized that the music aspect of the site is not bad at all. Also, some very prominent musicians have sites there as well. So, for all of you who are members of myspace.com, here is my url: www.myspace.com/jazzgenemusic. You can check out tunes of mine and see my upcoming performances and read my blogs. As well as becoming my cyber "friend". By the way, my album "Sandbox and Sanctum" was voted one of the top 10 albums of 2005 by AllAboutJazz. The composition "Free 2 Fast" placed in the semi-finals of the ISC Composition Contest and Discmaker's Independent Music World Series. Well, bye for now. Come by one of my gigs and say hello. Hello, readers and thanks for visiting. Just a few updates to what's going on with my music these days. I am presenting my music in trio format on November 2 at Water Street Lounge in Brooklyn. Harvie S will play bass and Beaver Bausch on drums. It starts at 9PM. On November 4th, I am trying something different and will do a quartet without a saxophone. Daniel Kelley will play the keyboards. This will be at Freddy's Backroom in Brooklyn and starts at 10:30PM. Harvie S and Gene Jackson makes up the rhythm section. On November 13th, I will be back at Blue Note with a very special guest. Dave Liebman will be joining my group for the performance. The performance will start at 12:30PM and the second set is at 2:30PM. Harvie S will play bass and Ted Poor on drums. I am quite excited about having Lieb on the gig. I have been listening to his music for over 20 years and, like a lot of other musicians, really like his work. So for me, it will be a musical performance which will put a mark regarding where I am at musically. You can check out all of this stuff on my itinerary page as well. By the way, shoot me an email (Gene Ess) if you want to share your opinions or have any questions regarding my music. I have an upcoming project in December playing my laptop and guitar in a "non-jazz" context. I'll post more info on it later as I am out of time now. Hello, and thanks for visiting my site. A lot has happened over these last few months and as we go forward, I wish all of you a healthy and happy fall. My new album "Sandbox and Sanctum - Song Cycle for Quartet" has been released from SIMP Records and is doing very well. The album was one of the top 10 requested and played albums during August and September on WNUR. The reviews have been very positive and I have received encouraging words from some veteran musicians as well. Some of these musicians, I have listened to since my teen age years and have been sort of my musical role model so it is very meaningful to me. One of them is Dave Liebman. He will be joining my group at the Blue Note on November 13th for a performance I am sure I will remember for sometime. Dave has been very positive and supportive of my musical efforts and I am very excited to have him play with my group. The rhythm section is excellent as well with Harvie S on bass and Ted Poor on drums. As a future project, I hope to do an album with Dave so stay tuned! On October 9th, I will be performing my music at the Europa Club with Harvie S and Gene Jackson. The performance starts at 8PM. And on October 21, my quartet will be at Kavehaz Jazz CafÃˆ. The group will be with Donny McCaslin on sax, Harvie S on bass, and filling in for Gene Jackson, Take Toriyama on drums. The performance starts at 9:30PM. What: Highlighting material from "Sandbox and Sanctum, Song Cycle for Quartet. Reviews of "Sandbox and Sanctum"
The album is available from: www.jazzgenemusic.com, www.cdbaby.com, www.amazon.com, and itunes as well. Thanks for listening and please support real music before we are all swallowed up by "corporate music"Ã– peace, Gene. Hello and thanks for visiting my site! 2005 is already half way through. Time sure is quick when you are having fun. Just want to give a big thank you to all of you that came to my Blue Note gig on May 29th. It was a full house again and the band really enjoyed playing the music for you. I hope you enjoyed the music as well. My new album is titled 'Sandbox & Sanctum - Song Cycle for Quartet' and will be released from SIMP Records next month. It is in replication at this moment so I am quite excited about it. I will put it up on the Recordings page as soon as I can. You will be able to hear some track clips and buy the album through that page. I am already planning for my next album and am thinking about doing some collaborative work with Daniel Kelly. Daniel and I have discussed it a little bit and hopefully, it will lead to good music. If you don't know Daniel, he's a great pianist/musician and regularly plays in Harvie S Group. On June 30th, I will do a trio gig at this new spot called Swanky's Speakeasy. It is located at 513 Columbus Avenue between 84th and 85th Street in Manhattan. The hit starts at 9PM. For more info: 212-579-2900. On July 7th, my group will be at the Tea Lounge in Park Slope, Brooklyn. It will be the full group with Donny McCaslin on sax, Harvie S on bass, and Gene Jackson on drums. My album should be out by then so I hope to have some fresh copies there for sale. Come down and hang! For more info: call 718-789-2762. The gig starts at 9PM. On July 16th, I will be at Kavehaz again with my old friend Greg Tardy on sax, Gene Jackson on drums, and Harvie S on bass. Music starts at 10PM. That is all for now. See you later! Hope everyone is having a great spring wherever you may be. I just wanted to make a quick update. My new album has been recorded and is being mixed and mastered as we speak. I am quite excited about the music on it and feel it was worth the wait and hard work to get the music just right. I'll have it up on my recordings page as soon as it is released. The album is made up of 8 quartet pieces which all tie in together. Sort of like 8 movements in a suite. I composed them over the past 12 months or so. Harvie S, Donny McCaslin, and Gene Jackson played great on it and I am very pleased with the way it came out. The music is quite challenging and was recorded after just one short rehearsal and has a "live" vibe to the whole album. On May 7th, I'll play some of my new music at Kavehaz with Harvie S on bass, John O'Gallagher on alto saxophone, and Beaver Bausch. Kavehaz is located at 37 West 26th Street in Manhattan. For more info, check out www.kavehaz.com. The gig starts at 10PM. On May 29th, I will be back at the Blue Note with my quartet. Gene Jackson will be in Japan so Beaver Bausch will fill in on the drums. Beaver plays regularly in Harvie S Group and is a great drummer. Harvie S and Donny McCaslin will be on hand to contribute their music as well. We will be playing music from the upcoming album as a preview to the release. The info: Blue Note, 131 W3rd Street, New York, NY. Tel: 212-475-8592. The 1st set is at 12:30PM and the 2nd at 2:30PM. It should be a great gig so come on down and enjoy some good music. The cover, I think is like $20.00 and that includes brunch and a drink so it is a great deal. Hope to see you at one of my gigsÃ– Ciao! Hello, readers. Here is the latest update to what is going on with my music projects. First of all, I will be recording my next album during the last week of March. It will be in quartet format with Harvie S on bass, Donny McCaslin on saxophones, Gene Jackson on drums, and me on guitar. It took quite a while to finish writing all the music for it but I finally feel the music is now right to do an album. I'll have the album up on my Recordings page when it is finally released. I have an upcoming project/gig with John O'Gallagher in May but I'll write more about it later. I am planning to do some new music for that one in a different direction. Anyhow, I am spending most of my waking hours these days preparing for the recording and hopefully all the work I've put into it will be meaningful. Hello and Happy New Year! Hope everyone had a peaceful holiday season. My group will be performing at the Kavehaz Jazz CafÃˆ on January 29, 2005. The gig starts at 10PM and goes until 1AM. It'll be a nice group with Harvie S on bass, Donny McCaslin on sax, Mark Ferber on drums, and yours truly on guitar. Kavehaz is located at 37 W26th Street in Manhattan. Call 212.343.0612 for more info. My next recording will be in March with Harvie S, Donny McCaslin, and Gene Jackson. I hope to have it released by June of this year. This will be more of an "acoustic" sound recording and the music will be all original. You'll be able to check it out here on my recordings page first, so come back and visit. I've also added more multi-media music at Productiontrax.com so if you are interested in such genre, check it out there. Hello and thanks for visiting my site. I've been a little lax in updating my site as you can see. I am ecstatic to be able to record this group next February if I can manage everyone's schedules. Harvie S is on board already and I am looking forward to it. I'll keep you posted regarding this recording. Also, a project with Gene Jackson, David Berkman, Mike Pope, and myself is still alive. We are recording later this month and hopefully, we will be able to present our original music at different venues around the world. Lastly, I have another electronic album on the back burner. My last album track called "Sanpan" was picked for the title/credit track for an upcoming movie in U.K. You can hear some samples of my music for multimedia at www.productiontrax.com. Well, 2004 is almost over. This year has been a great year for me and my family. We overcame some adversities and came out even better off. My son, Ryo is 16 months old and is the greatest pleasure in my life. I've met new friends and musicians this year and I thank all of you who have been part of our lives. Even the Boston Redsox won the World Series! I've been a suffering Redsox fanatic since 1985 and this past season was a magical year. My group will be playing at the Kavehaz Jazz Café on September 3 and 4, 2004. The sets start at 10PM. I will be playing some of my own music with Andy McKee on bass, Mika Pohjola on piano, and Gene Jackson on drums. Kavehaz is at 37 W26th Street near 6th Avenue in Manhattan. For more info, go to www.kavehaz.com. On September 26, I will be playing at the Blue Note. Harvie S will be playing bass, Donny McCaslin on sax, and Gene Jackson on drums. Blue Note set times are 12:30PM and 2:30PM. This should be a fun gig. IÃ­ve always enjoyed listening to Harvie S and playing with him on this gig should be a lot of fun. I've received quite a bit of email questions regarding digital music hardware/software. I will be putting up some of what I think about such gear on my Divertimento page soon. Kind of like my own review column. I think I will start with the new Max/MSP 4.5 for PC and Ableton's Live 4.0.1. Check it out. Hope the summer has been productive for all of you. Thanks for visiting my site. On July 16 and 17th, I will be playing at the Kavehaz Jazz CafÃˆ at 10PM. The group is myself on guitar, Donny McCaslin on saxophone, Kenny Davis on bass, and Gene Jackson on drums. Kavehaz is located at 37 West 26th Street, New York, NY 10010. For further info, call 212-343-0612. Kavehaz doesn't charge a cover so it is a good deal. Come down and listen to the music and enjoy the nice cafÃˆ. We'll be playing until about 1:30AM each night. I just received a confirmation regarding my next Blue Note performance. It will be on September 26th at 12:30PM 1st Set and 2:30PM 2nd Set. The group is going to be myself on guitar, Harvie S. (formerly Swartz) on bass, Gene Jackson on drums, and Donny McCaslin. I will be presenting my original music for this gig. The gigs I have done at the Blue Note have always been a blast. Decent turnout plus very professional staff working there. I'll post more info next month or so. Let's see, what else? Oh, Gene Jackson, David Berkman, and I have started a band project together. Hopefully, we'll be recording soon. We are looking to tour Japan later this year. David is a great pianist and Gene is one of my favorite drummers so I am definitely looking forward to what can happen. Getting into my computer music side, I am working hard with MaxMSP these days. It is a fantastic piece of software but the learning curve is steep. However, it is the most flexible and musical software I have yet to try. You can program just about anything with it and you don't even have to know any programming language such as C. If you do know C, then you can create your own routines and insert them into the global program, etc. They've already created hundreds of these programs called Objects for you and you are off creating synths, samplers, mixers, midi controllers, random music improviser, and much much more. Whew, haven't slept much these days. Last but not least, you can listen and download some of my music created for multimedia at Productiontrax.com. If you are looking for music/sound effects to use for TV, films, and other visual media, check it out. Just do a search on Gene Ess or Gene Shimosato and you'll be able to check it out. Hi folks. Just a short update for now. My group will be playing at the Kavehaz Jazz CafÃˆ on May 14th and May 15th. The performance starts at 10PM both nights. Kavehaz is located at 37 W26th Street in New York City. Here is a number to call if you need more info: 212.343.0612. I am featuring 2 different saxophone players for this gig. On the 14th, John O'Gallagher will be featured and on the 15th, it will be Donny McCaslin. I've known both Donny and John for almost 20 years! I am quite happy to have them on this gig, since we don't get to hook up too often. They both are sounding beautiful these days. Last but not least, Gene Jackson will be on drums as usual. Herbie Hancock just called him again for a gig and there is a reason for that. Gene is a great drummer and we always hook up musically. Thomas Morgan will be playing bass. After a few gigs with Thomas, I think he will really do great here in NY. Thomas is a very musical player and there is something very succinct in his playing. Thanks to all of you who made it down to the CBGB Lounge gig I did with Al Foster. It was a lot of fun and great hooking up with Al. He's a very down to earth guy and his sense of playing jazz music is amazing. My upcoming gig at CBGB Lounge on April 18th will feature Al Foster on the drums. It should be a lot of fun! Greg Tardy will be on sax and Thomas Morgan on bass. I'll be on guitar as always. Greg Tardy and I have worked together in the past with Rashied Ali on some other projects. It'll be great to play with him again. Thomas Morgan is a young bass player but already is making a name for himself. Al Foster doesn't need any introduction to jazz fans. Suffice to say he was one of Miles' favorite drummers. It will be a great band so come down and enjoy the music. The set starts at 9 PM! If you need more info, send me an email at gene@jazzgenemusic.com. On the 23rd of April, I'll be presenting my group at this club called The Jazz in Brooklyn. It is kind of new, so if you need to get more info on where it is, call 718-453-7825. It'll be the same quartet with Gene Jackson on drums instead of Al Foster. Lately, I have done a few mastering projects in my studio. I use Wavelab 4.0 by Steinberg and can master your recording projects. I mastered my Sunrise Falling album so you can check that out if you would like to hear a sample. Lastly, I have just started correspondence lessons, so if you are interested in taking lessons but do not live in New York City, you can email me and I can give you the details. A quick update. I will be performing at the Kavehaz Jazz CafÃˆ on February 4th, 2004. The gig starts at 8:30PM and goes on until midnight. Gene Jackson will be on drums and Elias Bailey will be on acoustic bass. It'll be a nice hang so come on by. Let's seeÃ– Trying to get my album done and it is taking longer than I thought. I guess you just can't force creativity when composing is concerned. In the meantime, I have some gigs coming up which I will post shortly when I have more definite info on the musicians involved. That is about it for now. This winter is as cold as I remember NY being. It is good incentive to stay in and practice all day and night! Stay warm. "In this album, Gene Ess draws the traits that identify his style with firm brush strokes. On the one hand, we have his jazz streak, and on the other hand, his exquisite sensitivity with the guitar, and as a final complement, his taste for sophisticated rhythms. His skill as a musician is sufficiently illustrated with his work in this CD, as well as the quality of the artists he has played with throughout his career, such as Carlos Santana. Sunrise Falling is a good sample of powerful Jazz-Rock with touches of Synth-Pop. "Even if you knew who Gene Shimosato was, you're still going to be surprised when you hear Gene Ess! Fans of electronic music and fusion will be most pleasantly surprised with Sunrise Falling. Ess lays it on thick with the aural fruits from expert tinkering with his self-built, PC-based studio and tweaked-out tones produced from a diverse arsenal of axes. An absolutely world-class core rhythm tandem of Matt Garrison and Jojo Mayer provides support, along with guest shots from past associates Rashied Ali (yes, of John Coltrane renown) and groove-merchant Fima Ephron. What makes Ess, Garrison and Mayer so mind-blowing as a unit is not only their familiarity with each other from past and present associations, but also their combined stylistic expertise at just about everything else, from provincial to progressive." "Sunrise Falling by Gene Ess takes a different approach to the guitar power trio, filling in every pixel of sound with electronic noise, samples, squelches and effects. The bassist for the majority of tracks is Matt Garrison (son of Coltrane bassist Jimmy) who was very impressive on Herbie Hancock's Future2Future tour. Ess occasionally turns off the synths for a bit of tasteful "poodle-poodle" style jazz, but he likes his analogue synths and sound trickery, including a weird phasing effect on the title track that gets right inside the cavities of your skull - a kind of mental floss. Other titles reflect Ess's Japanese heritage, grappling with the challenging tuning and pitch-following system of the traditional Roland guitar synth on Variant and playing tasteful, Koto-like acoustic guitar on Triptych and Katana." John L. Walters, The Guardian, U.K.
Also, this album was selected as one of the top 10 albums of 2003 by Phil DiPietro of AllAboutJazz.com. It is available from my recordings page here at my site. Thanks to all of you who have supported my music this year. A new album is on its way and should be completed by spring of next 2004. Finally, Happy New Year to everyone!